See below for the latest about the current show in NYC that includes documentary photos and a “living quilt” sample from my recent outdoor installation in a city park in Newnan, Georgia, created during a residency at Newnan Art Rez. As more and bigger natural catastrophes visit our planet, sustainable or ecology-based arts are gaining ever greater importance. Ecological art respects the ecosystems of living species and their environments from an ethical, social, contextual, economic and aesthetic perspective while seeking to remedy or preserve life. It is socially engaged and socially interactive, and at times even intervention-based art. The goals of such art are socially oriented, altruistic and hopeful in that they seek to spark awareness in the public arena about the urban environment’s issues and the alteration needed for a better future. 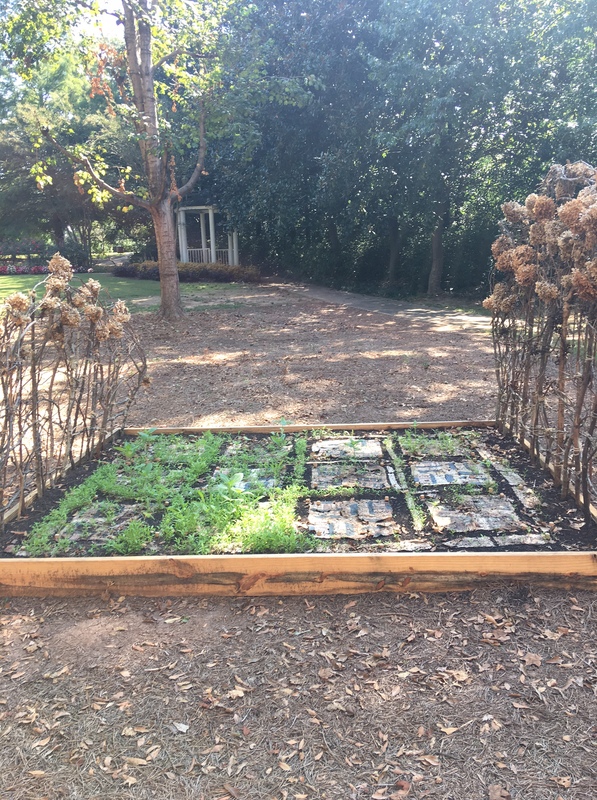 They often include audience participation and growing plants we see in Jane Ingram-Allen’s Living Quilt for Newnan a mixed media installation. 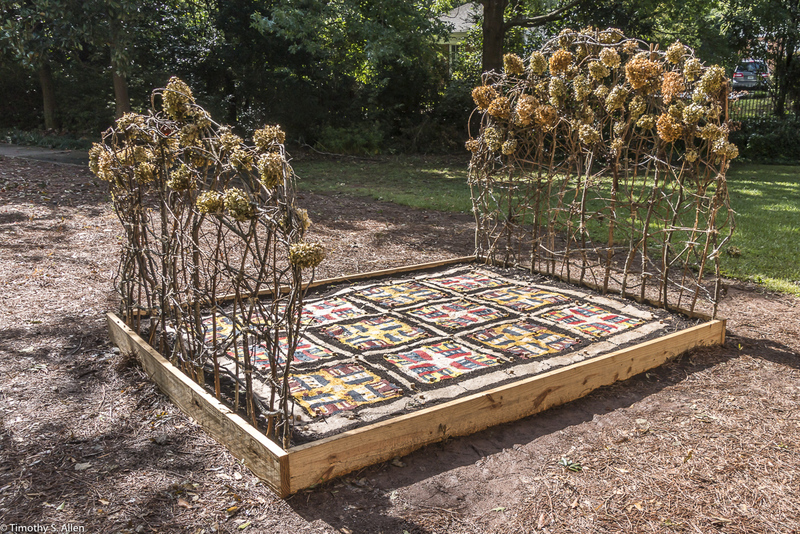 This “flower bed” with a “living quilt” as Ingram-Allen calls it, was done with community participation during her residency as a Newnan Artist in Residence in Newman, Georgia in the fall of 2017. Other artists engaged with eco-art are intent on bringing to the fore issues that involve the destruction of our environment. 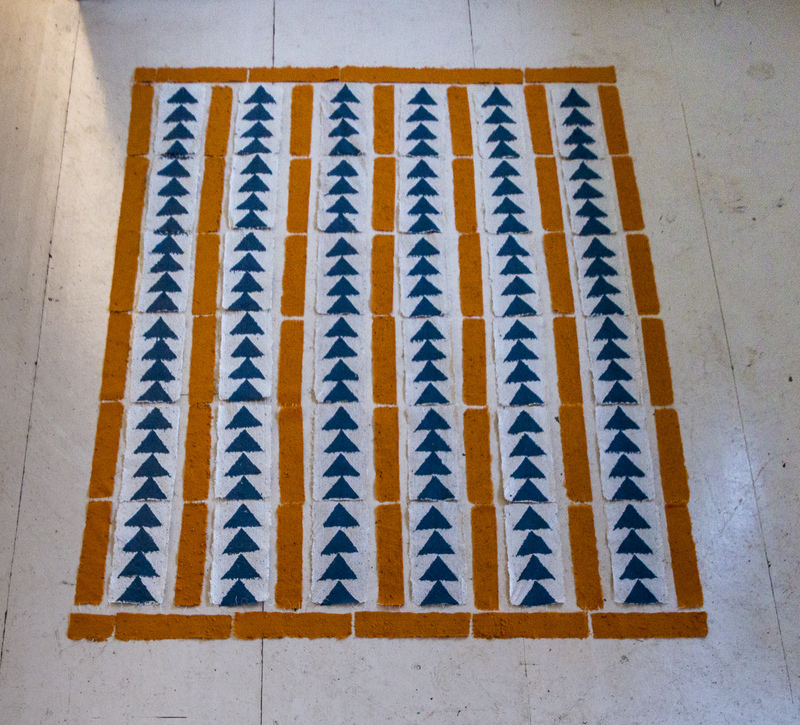 Barbara Roux does this in her site-specific installation At War with Plants Too. The title refers to the susceptibility of nature to human violence; additionally, it is the basis for Roux’s use of the native sycamore whose brown, yellow and green bark appears to be cloaked by camouflage patterns. Milena Popov utilizes natural materials such as tea to make her calligraphic horizontal paper works. One work entitled Landscape Painted with Tea: Conversation with Nature, 2016 . In her eco-painting, Popov carries on a conversation with nature while preserving it for posterity in her artworks. Joan Giordano in her Deforestation Birch Forest sculpture also addresses the field of sustainable art. Her wall sculpture with its wing-like span reaches out to us, much in the same way a mother would embrace her child, a very apt analogy of nature as nurturer. The work is created out of the cast off reddish-brown bark of young birch trees. Bill Pangburn in his Hudson Beisete series also deals with the destruction of ecosystems. His hope is to bring the issue to the forefront of public awareness, so positive changes can be made. By depicting the flow of water as he sees it daily on his bike ride home along the Hudson River, he is simultaneously meditating and commenting on the ephemerality of nature. Antigoni Kavvatha’s forests speak of her love for nature but also for drawing in a style advocated and associated with the academy for its use of chiaroscuro and its naturalistic qualities. But, the academic similarity stops at this point. Indeed, Kavvatha’s monumental horizontal friezes have more in common with site specific installation art and with Asian calligraphy than with an academic approach to drawing. Mary Hrbacek anthropomorphizes her trees to humanize nature in the hope of gaining sympathy for them. Hrbacek has dedicated a large portion of her career painting trees in cool colors that subtly allude to the icy landscapes of her beloved Scandinavian background. Ona B. is primarily an installation and performance artist who through her interventions and depictions of animals seeks to bring attention to their endangered status. Her commitment to diversity and conservancy is reflected in her small red paintings that depict animals such as the Asian rhinoceros which are threatened by extinction mainly through loss of their habitats or lack of genetic variation. In his panels, Giorgos Tzinoudis depicts the consumption of fish by larger fish as a metaphor for the greater human social crisis. His scenes in which smaller fish are eaten by bigger ones, establish a visual metaphor for overpopulation and extinction. This year Jane Ingram Allen from America, curator since 2010 for this art project, is back in Taiwan again for the 9th anniversary of the Cheng Long Wetlands International Environmental Art Project. Jane began the environmental art project in 2010 with the support of Taiwan’s Kuan Shu Educational Foundation in the small village of Cheng Long in Yunlin County, Kouhu Township, on the southwest coast of Taiwan. Jane has been in Cheng Long every year for the art project except 2017. This year she is co-curating the art project with Chao-mei Wang, who has been the administrator every year for the art project as well as the Head Educator for the Kuan Shu Foundation. Jane says it is great to be back in Cheng Long to see old friends and meet the new volunteers and see all the changes in the small fishing village, especially how much the children have grown. https://www.facebook.com/chenglong.artproject to see more information and photos as the artworks are created for the 2018 Cheng Long Wetlands International Environmental Art Project. 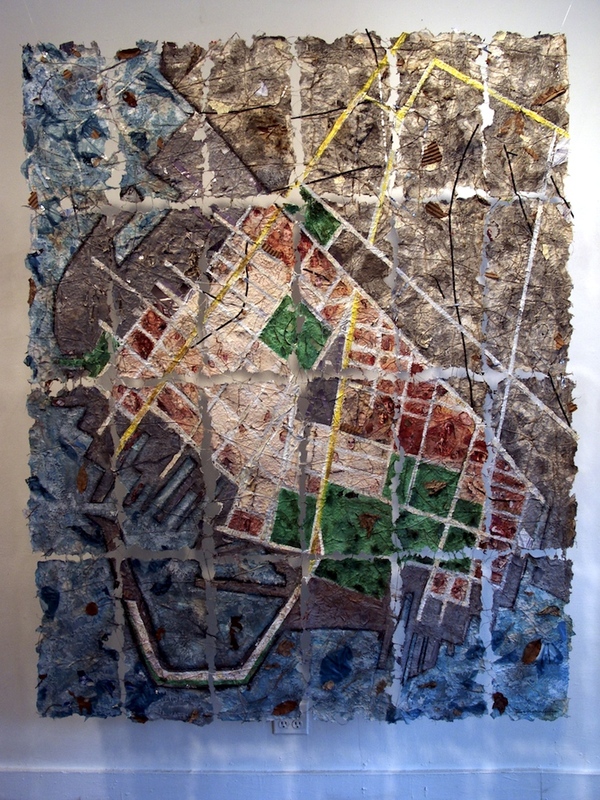 My pieces in the show include “Red Hook Site Map” created in 2003 when I was an artist-in-residence at Kentler International Drawing Space, Red Hook, Brooklyn. Also, my “Brooklyn Site Map” is included in this exhibition. Both works are mixed media map-based suspended installations using handmade paper I made from Brooklyn plants. I was invited to participate in this exhibition at Shiva Gallery, John Jay College, City University of New York, by curator Thalia Vrachopoulos. The exhibition “Green Habitat” includes works by 9 artists using diverse media who create ecology-based art focused on environmental concerns. I will exhibit photo documentation and a handmade paper sample from the eco-quilt installation “Living Quilt for Newnan” created at my August 2017 residency in Newnan, GA (www.newnanartist.org). “New Paper Road”, Hanji Theme Park, Wanju, South Korea, May 3-June 3, 2018. 2018 is the 20th anniversary of the Hanji Paper Festival in the traditional handmade paper village of Korea in Wanju. I was invited to exhibit one of my recent handmade paper artworks at this special anniversary exhibition in South Korea. I am sending a work that I created during my August 2016 residency at Boston Harbor Islands National Park titled “Peddock’s Island Birds”. 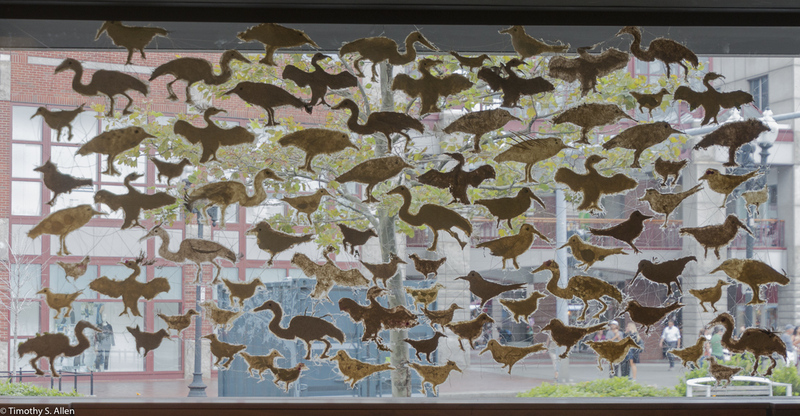 This work depicts the different species of water birds that are found on the island and is made with handmade paper from invasive plants of Peddock’s Island. I will have my mixed media handmade paper artwork titled “Piping Plovers of Fire Island” included in a group exhibition at Yolo Arts Center, Woodland, CA (https://yoloarts.org ). This exhibition curated by Yolo Arts Center staff features works inspired by walks in a park. My piece was created during my artist in residency in September 2015 at Fire Island National Seashore, New York. I used materials collected there and handmade paper I made from local plant waste materials. The piping plover is an endangered bird in this area, and the park rangers are protecting the beach nesting sites for the piping plover. I encountered a flock of piping plovers that inspired this piece early one morning during a walk on the beach at Fire Island National Seashore. “Living Quilt for Santa Rosa”, Rincon Ridge Park, Santa Rosa, CA: to be installed and dedicated in early 2019. “Living Quilt for Santa Rosa” is an ecological/environmental public art project by artist Jane Ingram Allen for Santa Rosa, California, to be installed in early 2019, in cooperation with the City of Santa Rosa Public Arts, at Rincon Ridge Park, off Fountaingrove Parkway, Santa Rosa. The project is in cooperation with the Public Arts Department of the City of Santa Rosa and dedicated to the healing and recovery after the October 2017 wildfires that were so devastating in Santa Rosa communities. There will be a series of public workshops and a public ceremony and dedication when the piece is installed. I am working with the city’s public arts coordinator, and we expect to do this project in February 2019. Please keep looking at my Blog https://janeingramallen.wordpress.com for updates on my artwork and art projects in 2018.